Aaron McIntosh,titles vary, 2018, (3) 30 x 40 inches ea. Invasive Queer Kudzu: Richmond is a participatory project and exhibition by artist and organizer Aaron McIntosh. In this ongoing project, McIntosh and participants create quilted queer kudzu vines of fabric and wire. Each leaf is adorned with stories of LGBTQ+ contributors and archive documents that celebrate and illuminate Southern queer culture. Using the invasive kudzu vine as an agile metaphor, the project disrupts dominant Southern conservatism and activates the vine, which is often perceived as monstrous, as a symbol for Southern queer tenacity. Represented in works on paper and a prominent sculpture, this exhibition features depictions of several monuments of the South being invaded and overtaken by queer kudzu stories. Most notable in the exhibition is the Jefferson Davis monolith, which currently holds sway over Monument Avenue and is under consideration for its physical removal by the Richmond City Mayor’s recent commission on the future of Confederate monuments. McIntosh’s installation figuratively aims to expedite the removal of this monument. The Confederate monuments stand as reminders of the enslavement and oppression of African Americans in the South; McIntosh takes an intersectional approach in developing a Southern history that includes the struggles of many marginalized communities that have faced racist, homophobic and xenophobic injustice. 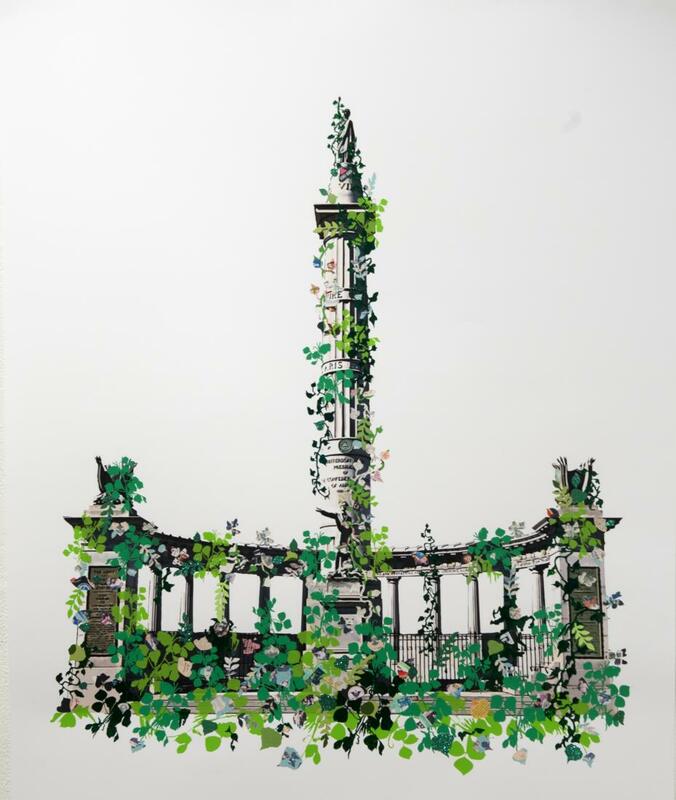 Taking a cue from the Parisian Communards’ felling of the Vendome column and its subsequent reconstruction, as well as Romantic era excursions to the sites of crumbling architectural antiquities, in Invasive Queer Kudzu: Richmond McIntosh leaves the destroyed monument in the gallery where visitors and participants will be able to contemplate thelegacy of problematic historical monuments and how destruction might be viewed as a critical stage in the life cycle of human history. At 1708, McIntosh will host a picnic series, open to the public, amongst the vine-covered ruins of the felled Jefferson Davis memorial column. These picnics will take place on weekends throughout the duration of the exhibition and will feature Queer Quilting Bees, where the kudzu story leaves will be quilted by queer people and their allies, as well as lectures and demonstrations by various speakers, community organizers, and kudzu enthusiasts. In this capacity Invasive Queer Kudzu: Richmond is also a platform for shared, yet diverse queer communities across the South to come together and strengthen their networks. By sharing their stories and building vibrant community, they invade and overcome the homophobic institutions that otherwise obscure such rich histories. See schedule of programming below! Aaron McIntosh grew up in Kingsport, TN, a factory town in the Appalachian foothills of East Tennessee. A fourth-generation quilter, his family’s working class environment and domestic life figure large in his visual vocabulary. McIntosh holds a BFA from the Appalachian Center for Craft and a MFA from Virginia Commonwealth University. His exhibition history includes Queer Threads: Crafting Identity & Community at the Leslie Lohman Museum of Gay & Lesbian Art in New York; Man-Made: Contemporary Male Quilters at the Craft and Folk Art Museum in Los Angeles; and Queering the Bibliobject at the Center for Book Arts in New York. His personal essays and critical reviews have appeared in the Brooklyn Rail, Hyperallergic and the Journal of Modern Craft. McIntosh's most notable awards are a VMFA Fellowship (2018), two Windgate Fellowships (2006 & 2015), and a Richmond-based CultureWorks community engagement grant (2017). Invasive Queer Kudzu: Richmond is made possible by Rick's Custom Frame + Gallery. Special thanks to Théo Bignon, and those whose hands have touched this work: Tyler Stoll, Marie Fornaro, Christina Sadovnikov, Laura Boban, Eric Anthony Berdis, Sarah Hudson, Kelcy Chase Folsom, as well as local arts organizations that have been integral to the project's success here in Richmond: Studio Two Three who has printed cloth kudzu leaves, Diversity RVA’s Iridian Gallery and Gallery Co-Chairs Michael-Birch Pierce and Jena Gilmore who have been hosting the Queer Quilting Bees on Saturdays leading up the exhibition, the Visual Arts Center and Sue Messmer, Side By Side and Emma Yackso, CultureWorks, the VMFA Fellowship program, and the VCU Arts Dean’s Office.